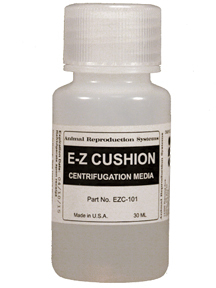 E-Z Cushion™ is a centrifugation media designed specifically to maximize equine sperm recovery. E-Z Cushion™ provides a soft barrier for the sperm pellet to rest on during this process allowing higher g-force and longer centrifugation times. Standard centrifugation techniques result in the recovery of up to75% of spermatozoa in the initial sample. Using a cushion will result in enhanced sperm recovery of greater than 95% without detrimental effects on sperm motility or morphology.